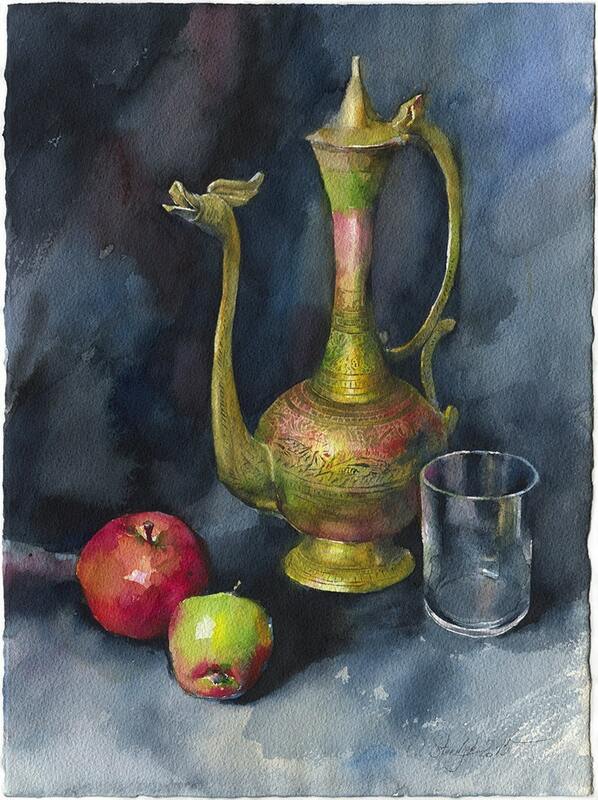 Original watercolor still life painting "Indian Teapot"
In most cases I don`t paint from the photos, and I don`t replicate my paints. So every of my items is exclusive. Hand painted, signed. If you like to order prints, every print is also signed. All my works aren't framed by default, because that increases shipping price too much. If you need framed picture, contact me and I'll calculate the price and needed time. Colors of painting may differ from preview you see on your monitor. It depends on your monitor settings. Shipping by regular mail. Originals are usually shipped with tracking number. Prints are shipped without tracking number. YOU CAN RECEIVE PERMANENT 10% DISCOUNT. To receive discount coupon, you need to send me a photo of my purchased painting in you interior or at least framed. I'd love to share such photos on my Facebook and I'll give you a coupon for that. Few words about me. I've graduated from National Academy of Fine Arts in 2008. I studied traditional painting and book illustration. I have Master of Fine Arts degree. Also I have 7 published illustrated books and few awards in Ukraine and other Eastern Europe countries. Absolutely gorgeous! I can't wait to frame them and plan to add more to my collection in the future. Sunrise over the sea - ocean sun, print of watercolor painting - "Sunrise at Crimea"
Return accepted within 14 days after purchase, buyer pays for return. If you order custom paintings/drawing, I always show you result before you approve shipping. So, no returns on custom orders. Shipping regular mail. Average arrival time is about 14 days. Shipping to Canada and Australia can take much longer (up to 40 days). I use envelopes with cardboard for Items up to 40 cm and plastic tubes for bigger sizes. Most of my items comes without frame. If item is framed, you'll understand that from photo and description. Average dispatch time - 7 days. Buyer is responsible for import duties and taxes. 1. Buyer who orders custom painting or drawing from photo is fully responsible for any copyright issues with provided photo. 2. Purchasing my painting or drawing doesn't give buyer any rights for making any commercial prints, reproductions or placing my images into any online printing services. You can't use it for any other commercial purposes as well, without my permission. So, for example, if you want put my picture on a package of your product, you need to ask me before.